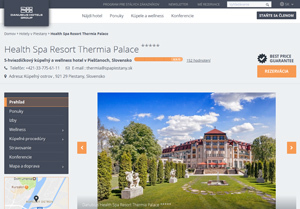 Use an excellent offer of the Danubius Health Spa Resort Piestany in the Art Nouveau Thermia Palace Hotel built in 1912 connected via corridor with the unique balneo house Irma. There you can take the healing bath in the healing mud pool - an architectural jewel with a dome 12 meters. Excellent Traditional Spa Stay with realLy pleasant therapists is highly recommended for the treatment of rheumatoid arthritis, back pain, fibromyalgia, Idiopathic scoliosis, scleroderma, osteoporosis, ankylosing spondylitis, rehabilitation after joint replacement etc. On the other side this Spa Stay is requested as well as strong prevention. Hotel Thermia Palace - 111 luxurious rooms, 15 suites with classic period furnishings. Individually-controlled air conditioning, flat screen TV, WiFi, safe deposit box, minibar, tea and coffee making facilities, bathrobes and two telephones are among just some of the first-class facilities you will find. Services such as room service, laundry, dry cleaning and parking are of course of the highest standards. The bathrooms are equipped with a hair dryer and a vanity mirror. There are also non-smoking rooms and rooms for disabled guests.